Though the timing of its announcement is simply coincidental with the CP+ 2015 show, Samsung’s replacement for its NX300 interchangeable-lens camera deserves a little bit more than the relative stealth it received. The NX500 incorporates tons of the latest technology from the company crammed into a compact package designed for people who want to step up from a point-and-shoot to better photo quality and speed. It’s on the expensive side given that it doesn’t have a viewfinder — $800, £600 and AU$1,000 for the kit with the 16-50mm f3.5-5.6 power zoom lens — though it’s a better deal relative to the competition in the UK and Australia than in the US. It’s due out around the world in March. I could list it all, but suffice it to say that everything on the inside is new, and some of the outside looks redesigned for the better. Samsung has crammed most of the high-end components from the NX1 into the NX500’s body: same sensor, same DRIMe V image processor, same hybrid phase-detection/contrast autofocus sensor, and almost the same 4K recording capabilities (it can’t stream 4K over HDMI and has no mic input). As a result, it should perform quite well. Though it can’t match the NX1 on continuous-shooting speed, 9 frames per second is nothing to sneeze at (caveat: I don’t know if that’s with autofocus). The design is updated as well. 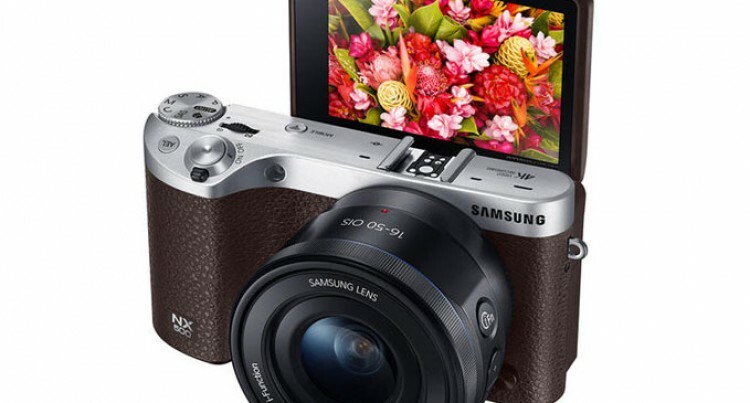 Rather than an articulated display, it uses a flip-up LCD like the NX300M, because selfies. It also has a more substantial grip, a physical autoexposure lock button, two adjustment dials — one on top and one on the back — and a zoom switch to use in conjunction with power zoom lenses like the one that comes in the kit. The record button has also been relocated to one of my least favorite spots, on an angled ledge above the thumb grip; I find it really hard to press those and it requires an awkward hand position to operate.